The Lone Star State's wine industry continues to advance with new varietals and increased consumer awareness. The Texas Hill Country AVA is the country's second largest. It has two sub-regions: Fredericksburg and Bell Mountain, the state's oldest AVA, where Kuhlken Vineyard (pictured) is located. Following a model similar to that of a craft brewer, The Austin Winery has been breathing new life into the Texas wine industry from its full-production urban winery in the heart of the Lone Star State’s vibrant capital. While working in winemaking and brokerage for small, family-owned wineries in California, co-founders Ross McLauchlan and Cooper Anderson decided to embark on winemaking in their home state. “We saw Austin as a growing market with a high level of education and a good drinking culture,” says McLauchlan, The Austin Winery’s president and CEO. With a focus on dry, earthy styles, The Austin Winery sources most of its grapes from organic and biodynamic vineyards in Texas’ High Plains and Hill Country AVAs. Some of its current Texas-sourced wines include Calaveritas Malbec ($30 a 750-ml. ), Work Horse, a blend of Merlot and Petit Verdot ($23), the Chenin Blanc and Viognier blend Friends With Benefits ($18), and Texas High Plains rosé ($24). When it was first established in 2014, The Austin Winery produced wines from about 50% Texas-grown grapes, with the rest sourced from California, Oregon, and Washington. Four years later, the company says it’s currently using about 90% Texas grapes for its wines. “We feel that we can now really do everything we want with Texas fruit,” explains McLauchlan. The Austin Winery is part of a new crop of fresh talent emerging in Texas winemaking, which traces its roots to vineyards planted by Franciscan priests in the 17th century. But it wasn’t really until the 1970s when the state’s modern industry was born. 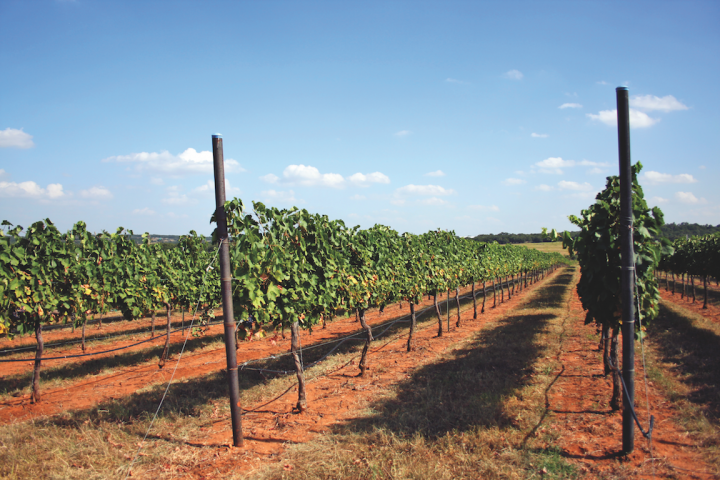 Today, Texas has eight federally designated AVAs and more than 4,000 acres of bearing vineyards. 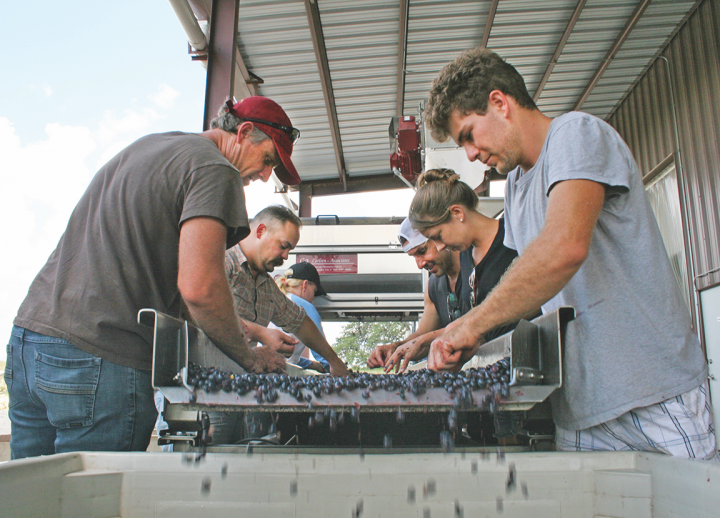 Around 430 wineries are in operation, according to the Texas Wine and Grape Growers Association (TWGGA), and they’re supported by a number of wine trails. The TWGGA reports that the Texas wine industry contributed more than $13 billion in total economic activity to the state last year. The Kuhlken family has been growing grapes in its Hill Country vineyard (pictured) since 1995. Despite the Lone Star State’s vast expanse of territory, wine grape-growing is largely centered around two distinct AVAs—the High Plains in the West Texas Panhandle and the Hill Country in Central Texas, with Austin and San Antonio on its eastern border. Established in 1991, the Texas Hill Country is the second-largest AVA in the United States at 9.6 million acres and includes two sub-regions: Bell Mountain and Fredericksburg. With elevation ranging from 435 feet to 2,100 feet and predominantly clay loam and sandy clay loam soil over limestone and granite, the Hill Country features exceptionally diverse terrain and weather patterns. Meanwhile, the High Plains—the state’s second-largest AVA and third-largest in the United States at about 8 million acres—sits on a plateau at about 2,800 to 4,000 feet above sea level and boasts a more consistent, dry climate. The High Plains AVA currently produces about 80% of Texas’ wine grapes, according to the TWGGA. The state’s other AVAs include Escondido Valley, Texas Davis Mountains, Mesilla Valley, and Texoma. 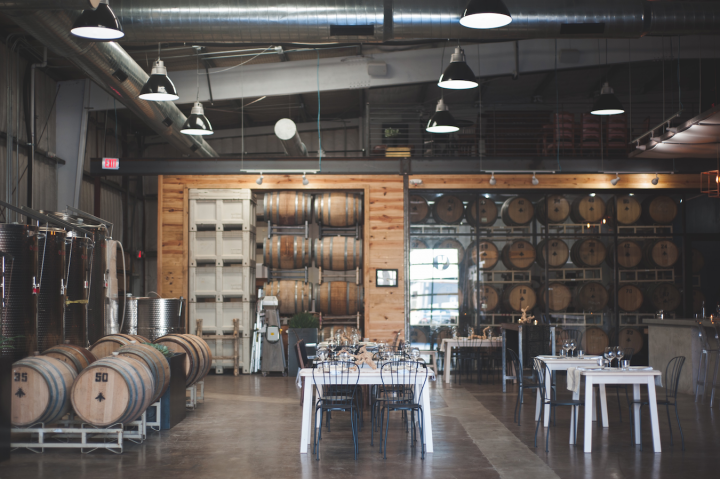 In the capital city of Austin, The Austin Winery (tasting room pictured) has followed the path set by craft brewers to bring new life to the Texas wine industry, including have a local focus. The McPherson Cellars portfolio is led by its Sangiovese ($20 a 750-ml. ), Viognier ($18), Roussanne ($18), and the Rhône-style blend Tre Colore ($18), with the dry Les Copains rosé ($18) also showing promise. But the winery is eager to get behind more obscure varieties like Picpoul and Carignan, which it says have shown great potential in the High Plains AVA. Like most of the state’s wineries, on- and off-premise distribution is focused primarily on the Texas market, but McPherson Cellars’ distribution is slowly growing across state lines, with Washington, D.C., Maryland, Virginia, South Carolina, and Iowa currently part of its footprint. The company is also eyeing the New York and Illinois markets for eventual distribution. 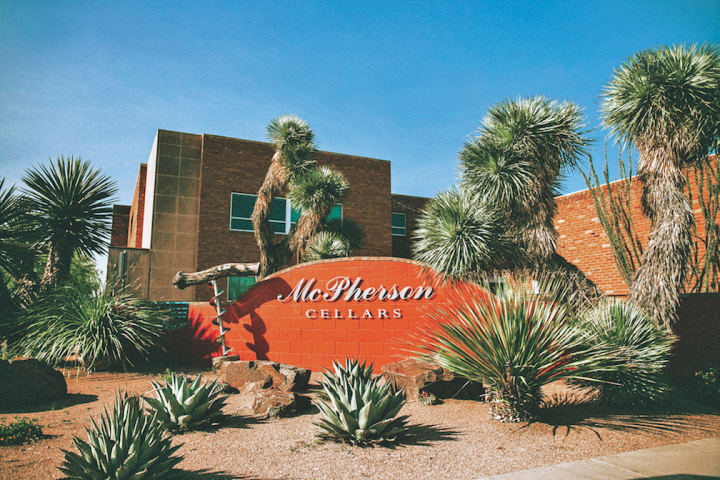 With the High Plains’ diurnal temperature variations and low humidity, McPherson Cellars sees vast potential to expand grape production in the region. “There aren’t really other regions that show as much promise as the High Plains—there’s over a million acres that could still be planted,” says McPherson. 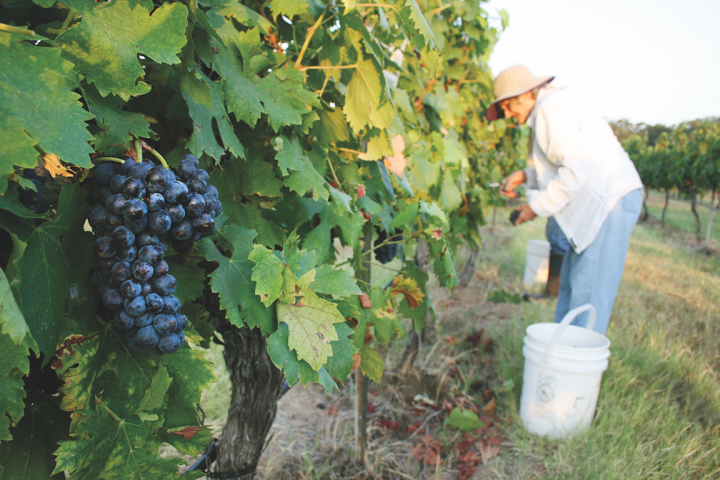 Hundreds of miles to the east, the Kuhlken family has been growing grapes in its Hill Country vineyard since 1995, when Larry and Jeanine Kuhlken began selling them to local wineries. Since 2006, the family has been producing fine wines for its Pedernales Cellars label, with a focus on Tempranillo and Rhône varieties that suit the region’s unique microclimates and mineral-rich geography. Pedernales Cellars’ flagship wines include the Texas Hill Country Tempranillo ($40 a 750-ml. ), Tempranillo Reserve ($60), Texas GSM Mélange ($35), and Viognier Reserve ($40). The wines are currently distributed to all major markets in the state, with a focus on the on-premise. Located in the Bell Mountain AVA—the oldest AVA in Texas—the sustainable Kuhlken Vineyard sits on the Llano Uplift in the northern Hill Country, while the winery and tasting room operate in the town of Stonewall, along the popular 290 Wine Trail. “The Texas Hill Country varies quite a bit from place to place, imparting structure and minerality to the wines,” says Julie Kuhlken, who owns Pedernales Cellars with her brother, David Kuhlken. “The style of winemaking here is increasingly oriented toward dry wines.” As the state’s wine industry evolves, the Texas Fine Wine marketing group has emerged to promote the high end within the state’s wine industry, with Pedernales Cellars as a founding member. Other members include Bending Branch Winery, Brennan Vineyards, Duchman Family Winery, and Spicewood Vineyards. Raising the profile of Texas wines has also been an important part of Pontotoc Vineyard’s mission since its founding in 2005, when owner Carl Money first planted five acres of Tempranillo. “I was the second planter of Tempranillo in the state, and now it’s a grape that’s predominantly planted here in Texas—and for good reason,” Money says. Pontotoc Vineyard uses exclusively Hill Country grapes for its entire portfolio, which includes the Estate Tempranillo ($30 a 750-ml. ), Smoothing Iron Mountain red blend ($30), San Fernando Academy red blend ($25), and the recently bottled Estate Albariño ($25), the winery’s first white wine. The Pontotoc vineyard is also located on the Llano Uplift near the historic town of Pontotoc, which was wiped out by typhoid fever in 1896. The Money family began buying the abandoned sandstone buildings in the town and soon set up the vineyard. Because of its remote location, Carl and his wife, Frances Money, also run the Pontotoc Vineyard Weingarten in the tourist-friendly town of Fredericksburg, a former German settlement 80 miles west of Austin that welcomes about 40,000 visitors every weekend. Texas native Doug Lewis notices his fellow winemakers in the state looking to regions of the world beyond California for inspiration and adapting to fresher styles of wine that suit Texas’ pervasive heat. He began making wine as a side project while working at Pedernales Cellars and finishing his business degree in 2010, and went on to found Lewis Wines with his friend, Duncan McNabb. In 2011, they purchased a 100-acre Hill Country property and built the winery the following year. By early 2014, the team had planted the Lewis Estate Vineyard with Touriga Nacional, Tinto Cão, Alicanté Bouschet, Tannat, and Arinto. Lewis Wines also sources grapes from a number of sustainable growers in the High Plains and Hill Country AVAs, as well as one grower in East Texas. Lewis Wines’ most popular label is Swim Spot ($14 a 750-ml. ), a bone-dry, Vinho Verde-inspired wine made with Blanc du Bois that’s lightly effervescent and has a low abv of 9%. The rosé category has also been a big hit for the winery. In 2013, Lewis Wines produced 25 cases of a dry Mourvèdre-based rosé; this year production surged to 1,300 cases across five different dry rosé wines, such as the 2017 Hill Country rosé ($18) and 2017 Round Mountain rosé ($25). “Rosé production has jumped in a major way in Texas,” says Doug Lewis, co-owner and winemaker at Lewis Wines. “It fits in with the culture here—with our spicy food and high temperatures. It’s tough to drink a high-alcohol red wine after you’ve been out in the sun all day.” Lewis Wines still produces a number of red wines—which Lewis says are just as popular as the white and rosé wines in the portfolio—such as the Texas Tempranillo ($20) and 2012 Round Mountain Reserve blend ($55). The Texas category’s expansion has slowed in recent years for Spec’s. While it was once common for the segment to grow at about 15% a year, over the past couple of years the retailer says it has grown 2%-3%. Clark, however, notes the successful impact of in-store tastings, especially for high-end Texas wines. 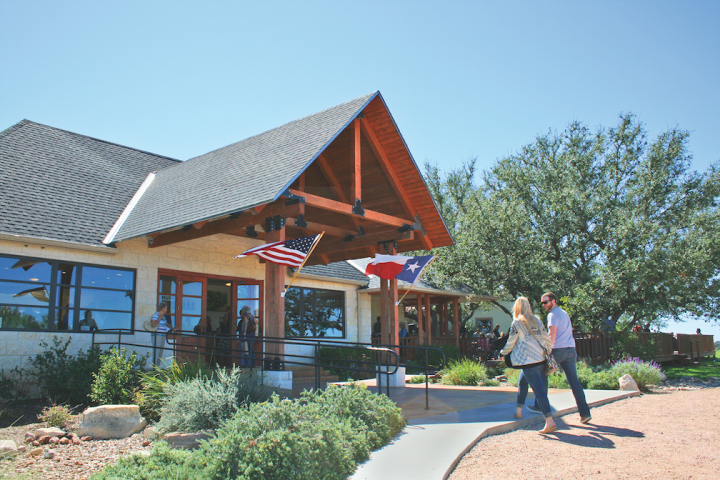 South Texas-based Texas SouthWind Vineyard and Winery has actively promoted its wines in Spec’s stores, with about a dozen demonstrations held every weekend. As a result, Spec’s says the winery is one of the retailer’s most popular sellers despite having an average price of $17 a bottle. Pedernales Cellars is also looking to the national wine market, anticipating it will eventually open up for Texas producers as more vines get planted. “Some large plantings of wine grapes have come online in the past few years, and this will let Texas have a robust bulk market that would ease the vintage variation and allow for more price competition,” Kuhlken says. Production will need to be ramped up, however, for many players to be able to compete on the national stage. While Texas pride may be behind many locals’ support of the industry, the Texas category still needs to work to better define itself before attempting to compete with more established wine regions. Pontotoc Vineyard is a member of the Texas Wine Growers, who have been lobbying to get labeling laws changed in the state. Currently, a wine can be labeled as a Texas wine with 75% of Texas-grown grapes. “Our mission is to protect the integrity of the Texas wine industry by promoting the use of 100% Texas fruit in 100% of Texas wine,” Money says. “We’re not going to be taken seriously nationally or internationally if we don’t get this law changed.” While the effort was defeated during the state’s most recent legislative session last year, Money says they will continue pushing for the change looking ahead.